UK firms need to continue to have "barrier-free" access to European Union markets after Brexit, the CBI business lobby group has warned. It said UK companies should not be subjected to trade tariffs, with only "minimal" other barriers in place. In a report, it also called for a migration system that allowed firms to obtain the skills and labour they need. The government said it was committed to delivering the best possible access to European markets for UK businesses. The CBI reiterated its call for a "smooth exit" from the EU, avoiding a "cliff edge" break. It said it had held "thousands of conversations" across the country with trade associations and firms of all sizes since the June referendum vote to leave the EU. 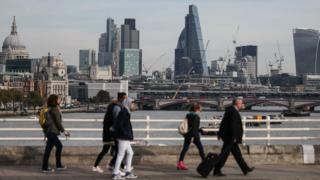 "There are serious concerns in the business community about disruption if the day after the UK leaves the EU, its final 'deal' is not complete, with all trading and regulatory issues fully ironed out," it said. Its report urged the government to adopt a "whole economy" approach to ensure individual sectors are not penalised. "There are some companies for whom avoiding high tariffs on their goods trade is critical, and others who prioritise avoiding non-tariff barriers to trade, particularly around services," it stated. "Additional barriers to any sector's trade will be detrimental to other sectors. A new arrangement with the EU must therefore be open and comprehensive, covering goods and services, tariffs and non-tariff barriers." According to the report, businesses also need a clear plan for future regulation that balances the need for "influence, access and opportunity" in the EU, protection for the social and economic benefits of EU funding, and a renewed focus on global economic relationships. CBI director-general Carolyn Fairbairn said: "Leaving the EU will be a highly complex process and all sectors of the economy are making their priorities clear in order to get it right. "The government will need to take a 'whole economy' approach to avoid leaving sectors behind." A government spokeswoman said it agreed with the CBI's call for a smooth and orderly exit that works for all parts of the economy. "The prime minister has made clear that we will deliver the best possible access for UK businesses trading with - and operating within - the European market," she said.